Steam cleaning has been embraced in the cleaning industry as an eco-friendly cleaning method which maintains and exceeds efficiency when applied to a variety of cleaning applications. This is largely in part to the minimal amount of water which is used in steam cleaning. Also, the sanitizing, sterilizing power of steam largely reduces or eliminates the need for chemicals. Steam is proven to be safe for a variety of surfaces, including upholstery, vehicle interiors and exteriors, and floors, providing sanitizing and deodorizing benefits. The Optima Steamer is an environmentally friendly steam machine which is revolutionizing the way steam cleaning is performed. The Optima Steamer uses the latest steam technology to remove stains, grease, dirt and odours from any variety of surfaces in a quick and efficient manner, all while generating no waste water run-off. Please contact us for references and more information on the Optima Steamer. 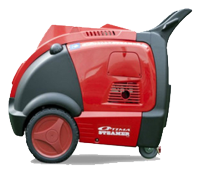 For flexibility of use, the Optima Steamer comes in Diesel or Electric models.